+100% Rare Enemy Chances during the scheduled Interrupt Rankings below. Everyone who uses 2,000 or 5,000 AC during the campaign period will receive special prizes. Purchasing Items in the AC Shop. Using AC through the Makeover Counter. Purchasing a new character with AC. Adding or Resetting Skill Trees with AC. Transferring your character to another ship. Just complete these client orders from Hans during the campaign period to receive several presents. More Interrupt Ranking boosts are coming to you this week. See how many bosses you can defeat during their scheduled times! Interrupt Ranking events will have two bonuses applied; +400% rare drop boost, and +100% Rare enemy chances while the event is active. 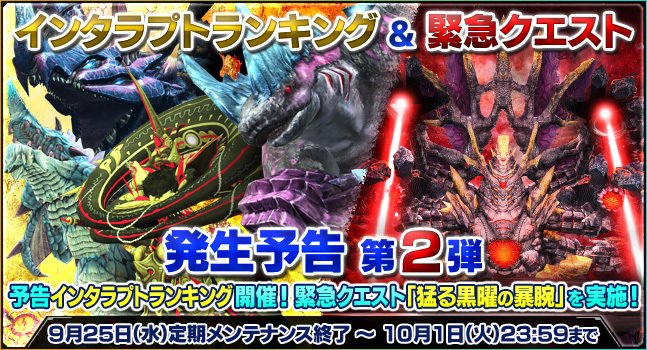 Quna will summon the buffed up version of Dark Falz 30 minutes after her concert ends.